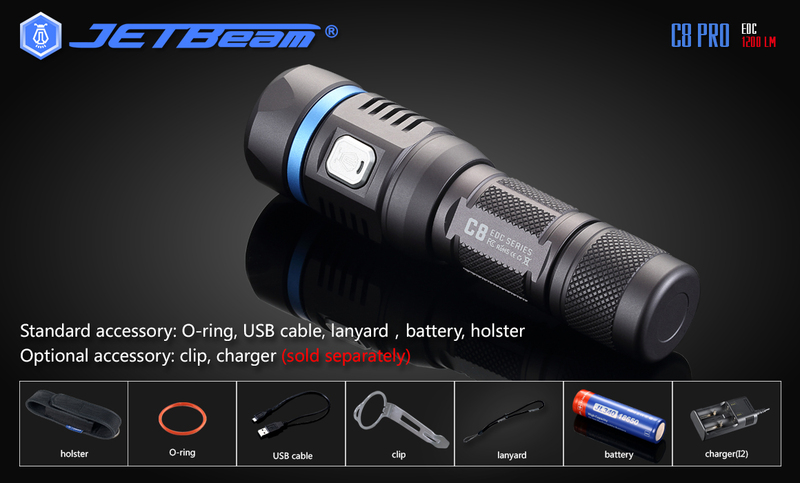 Best Jetbeam C8 Pro Flashlight I’ve Ever Owned, News-JETBeam Electronic Technology Co.Ltd. The Jetbeam C8 Pro is my favorite small flashlight. I have one in my toolbox, my hunting pack, the glovebox of the Jeep, the truck, my wife’s purse, and several more for other uses. At firstly. I bought the Jetbeam C8 flashlight along with my camping journey. High performance matters when you're camping or on a search and rescue mission, and the Jetbeam C8 Cree XM-L2 LED Flashlight provides a powerful 1000 lumen output and lengthy beam distance. Featuring intelligent temperature and power control, these Flashlights crafted by the specialists at JETBeam have a digital constant current integrated current for excellent long term performance. The aluminum alloy construction as well as shock and waterproof performance ensure that you're ready to approach the open road with the Jetbeam C8 Cree XM-L2 LED Light. Rechargeable for use year after year, the Jetbeam C8 Cree XM-L2 LED Waterproof Flashlight is a great option for any outdoor explorer.